Six participants of this amazing recreate the tragic and strange story of African Mosley Motanga, who in the dashing 90s of the last century stole a locomotive (with him was his friend Roma) and drove it in the winter from Irkutsk to Novosibirsk to meet with his sister. African ancestral songs, excerpts from Gypsy, French and Siberian folklore, free jazz themes, throat singing and video-a hallucination of the main character, against which there will be dancers and musicians. This story was listened to and watched by avant-garde fans in Moscow, Nizhny Novgorod, Belgorod, St. Petersburg, Irkutsk, Voronezh, Dusseldorf, Stockholm, Rotterdam, Hamburg and Berlin. In each new city, new musicians participated in the project, and this story looked new. Musicians: Igor Titenko (tenor saxophone, trumpet, flute, vocals), Stefanie Janssen(vocals), Hernán Samá (tenor saxophone), Björk Níelsdóttir (vocals , strings), Pietro Elia Barcellona (double bass), Izabella Pacewicz (performance). This entry was posted in Uncategorized on 11/04/2019 by astarotheatro. This entry was posted in Uncategorized on 04/04/2019 by astarotheatro. “It is what it is, it’s all the same to me”, Ivan’s prologue. Is that ostensible latency the main element of Ivan Ivanovich Nyukhin, the character of the monologue “On the harmful effects of tobacco”? The plays of Chekhov have definite intensity and the fire of action, but not in an external outline rather than in their internal structure. Under this ostensible latency and inertia of his characters, is hidden a multifarious and complex activity which is given with original virtuosity and deep knowledge of the psychical temper of every character. Possibly because these characters are mirroring his personal psychical status: the tyrant father, the solitude of his childhood, the loneliness of the boring small town where he grew up. This play is not a comedy either a drama. It is an excellent narrative of an ordinary person, a psychography given in a literary way which reflects the still and depressive life of the delusional society of Tsarist Russia. The way Ivan is “moving” looks like he lost his orientation in life. There is a force inside him that makes him unmovable. He is giving a lecture on the harmful effects of tobacco though he is smoker himself. Why? So many unfulfilled dreams, Don Quixotic ambitions condemned to fail into the dull routine of daily life. In our interpretation of the play there is something “new”, like the sense of hope that a new born baby is giving. We welcome you to discover it! This entry was posted in Uncategorized on 28/03/2019 by astarotheatro. This entry was posted in Uncategorized on 05/03/2019 by astarotheatro. 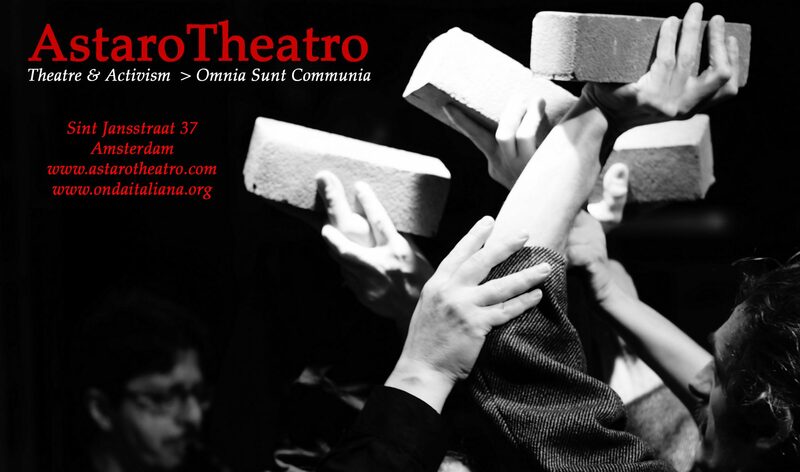 Get ready for our Theatre Performance in May and check our Page! This entry was posted in Uncategorized on 22/02/2019 by astarotheatro.